Business needs more storytelling evangelists. 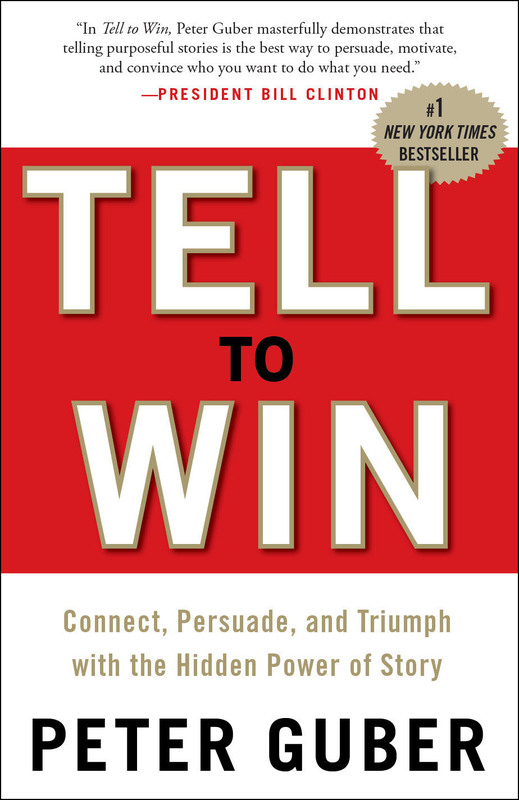 Even before picking up the book “Tell to Win,” I’m thinking that Peter Guber serving as the face for the storytelling movement is a good thing. He’s got the street cred, having penned “The Four Truths of Storytelling” for Harvard Business Review in 2007 (more on this later). Plus, no offense to Steve Denning, the high priest of institutional storytelling, but Peter Guber brings celebrity and a certain “je ne sais quoi” to the cause. I mean, this is the guy who produced “Rain Man” and goosed Dustin Hoffman’s career. Such a bias I took into reviewing his book. As you would expect, Peter knows how to tell a story. We learn that then presidential candidate Bill Clinton used the movie “High Noon” as a backdrop to tin cup for $90K to keep his campaign alive after losing the New Hampshire primary. We learn Famous Amos liked the cookie business better than the agent business. We learn Peter went on the movie set to tell Dean Martin to shape up only to have Frank Sinatra intervene with a “Who the hell are you?” before physically pushing him out the door. Does the book teach business people how to apply storytelling in their jobs? Before going further, keep in mind that Peter focuses on oral storytelling. If you need to win someone over to your way of thinking, don’t get on the phone or send an e-mail or draft a 140-character plea on Twitter. Get face-to-face with the person (or people). With this as the backdrop, I found three takeaways that frame the book. First, recognize that emotions play just as an important role as intellect in how people make decisions. Stories – not facts, figures and spreadsheets – tap the heart. This concept can be difficult to grasp for those coming from technical orientations who worship the tangible. Two, the book explains the importance of personalizing your story with a hero. And three, storytelling offers a means to show vulnerability, a quality for building trust. Putting the double negative aside, it’s an excellent point. For those who favor their geek side, the book tackles the cognitive part of storytelling as well. Allow me to simplify the equation. There were a couple parts in the book that didn’t work for me. The inconsistency in one particular story rubbed me the wrong way. Peter’s quest to film in the waters of Havana Harbor hit a standstill until Fidel Castro set eyes on Miss Universe, Shawn Weatherly. Also, I could have done without the pop psychology lesson; i.e., Larry King stayed at CNN because Ted Turner knew King put loyalty above money due to his father’s premature death which King interpreted as disloyalty. Still, these aren’t major flaws. All in all, I liked the book as well as the idea of Mr. Guber bringing greater attention to the storytelling movement. As long as the reader doesn’t expect “Tell To Win” to be a magic wand transforming one into part Steve Jobs, part Ken Burns, we’re good.